Are the Tutors at Oodles Learning qualified to conduct the thinkingMath programme? Yes. All tutors at Oodles have been have been assessed and qualified by onSponge before they start teaching at Oodles Learning. Qualified tutors will be trained in the thinkingMath strategies and also be engaged selectively in the thinkingMath initiatives driven by onSponge directly. What are Certified Partners for the thinkingMath Programme? Oodles Learning is a Certifiied Partner for onSponge's thinkingMath programme and is qualified and licensed to conduct the programme in Singapore. What are the credentials of the Tutors? • Facilitate at the thinkingMath™ workshops. • Serve as trainers to other teachers, educators and parents. Are the students in each class of similar learning abilities? While every attempt is made to place students of similar abilities into a class, this may not be feasible all the times. The class is therefore kept reasonably small to allow the Tutor to better facilitate the learning through some level of personalised attention. The Tutor will moderate the pace of learning by providing the higher abilities students with advanced questions to optimise their potential. The lower-ability students may be provided more rudimentary exercises to strengthen their foundation and reinforce understanding. Will the Tutor provide extra time to coach on sums not provided from the Tuition class that my child is unable to solve? The Tutor is more than willing to assist appropriately. As time is limited during the Tuition class given the Tutor’s target lesson plan to complete and his need to attend to the next class, we advise that the problem sums be posted to the onSponge Forum where the community including the team at onSponge will be there to help appropriately. You may be informed that the solutions provided by the community are moderated by the onSponge team. Does the Tutor cover the Math Exam Paper 1 question types? The Tutor focuses on problem sums solving typical of Math Exam Paper 2. The arithmetic and rudimentary concepts will be addressed appropriately via the problem sum solution steps. Occasionally, homework assignments on questions typical of Paper 1 will be provided by the Tutor to assess the student’s area of weaknesses. Parents are strongly advised to help strengthen the student’s performance in Paper 1 by providing the child with past year exam papers to practise at home within the 50 min time (upper primary) frame on a weekly basis. Class practice worksheets will be provided during every lesson and this is further supported by additional homework material to reinforce learning and understanding. Your child is expected to complete the homework provided on time as this will aid in the performance of the child and ensure he paces along with the class. Is the thinkingMath curriculum in line with the school’s? We follow the school syllabus and incorporate the thinkingMath strategies in our curriculum. May I reproduce the materials provided by the Tutor? The materials are copyright of onSponge Pte Ltd and others supplied by Oodles Learning are proprietary as well. No further reproduction and distribution of material is permitted without the written permission of the respective copyright owners. What materials are provided to the students? All students will be provided worksheets based on the thinkingMath curriculum and these serve as classroom practice materials, homework assignments and review papers. Students may also be required to purchase onSponge thinkingMath books for further practices and this will be advised by the Tutor accordingly. Would I need to provide my child with assessments for practices in addition to the assignments given by the Tutor? The material provided by the Tutor is based on a curriculum work plan designed to cover the key learning objectives essential for the student’s readiness for the Math Paper 2 for PSLE. Additional and appropriate assessment materials provided by yourself will certainly help given that more practices and increased exposures will help to enhance your child’s problem solving skills. Are the materials provided free-of-charge? An annual material fee of $50 is charged for the production of the worksheets. This is a flat fee that is non-refundable nor pro-rated and is payable upon commencement of the tuition class regardless of the time of registration. Oodles Learning reserves the right to request for additional material fees should there be an increased in the material production cost. All other workbooks including onSponge thinkingMath books will be paid separately. How are fees payment made? 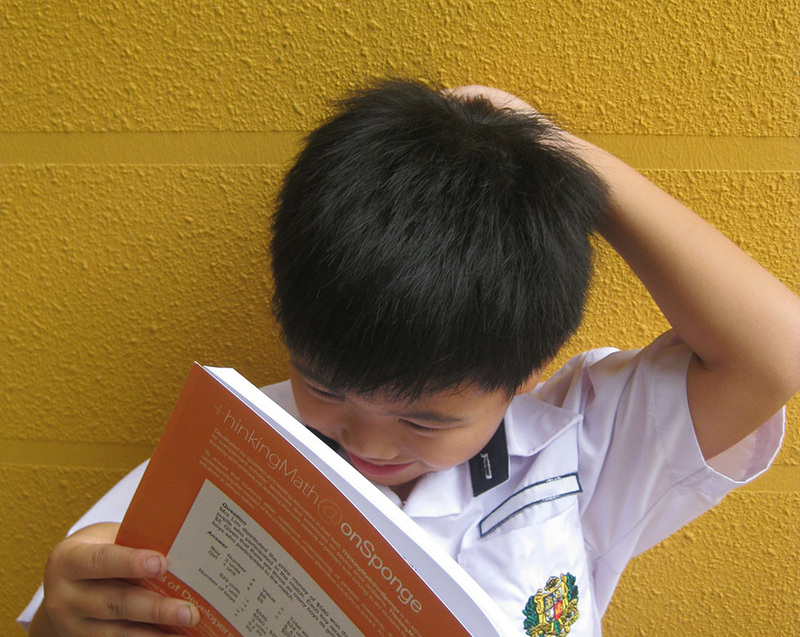 All fees to be paid in cash or cheque made payable to “Oodles Learning Pte Ltd”. Is the tuition fee collected in accordance to the month or the actual lessons conducted? Tuition fee will be collected on a quarterly basis (Jan to Mar, April to June, July to September, October to December), as per lesson schedule as provided by the centre. Any extra lessons conducted will be made payable together with the fees in the following month. What are the other charges I will need to pay apart from the lesson fees? You will be required to place a $200 deposit which is refundable upon giving the Centre 1-month written notice. The other charges include registration fees of $40 (one time and not refundable) and annual material fees of $50 (not refundable and not pro-rated). Will there be any fees rebate for lessons missed? There is no fees rebate for all lessons missed including taking leave during the school holidays. Are there lessons during the school holidays? The thinkingMath curriculum is based on a 48 to 52-week lesson plan as the programme is both topical and strategy-based coupled with many Review Papers. There is therefore lesson during the school holiday given the need to complete the curriculum set for the year. Should there be a change to the schedule during the school holidays, you will be informed in writing via email. The Tutor’s focus for the Tuition classes is in the problem sums of the Math Exam Paper 2. Class typically commences with the teaching and explaining of the rationale behind each topic or strategy or concept that the Tutor introduces to the students. This is supported by a show-and-teach of sample questions and solution as well as thinking processes. The students will then be provided with classroom practices which the Tutor will review appropriately with the students after their attempts on the sums by themselves. At the start of every lesson, the Tutor will go through the previous week’s homework assignment before embarking on the week’s new lesson which may be topical or strategy-based. This is followed by the teaching of the next new topic/strategy then class assignment where the students put into practice what they have been taught. It is during this time that the Tutor will walk about to observe the students’ work, highlight important considerations based on his observation and provide the required personal attention to aid those need further clarifications. Is the tuition premise conducive for learning? The tuition premise is designed to facilitate classroom learning fully equipped with teaching aids. The children’s comfort is also taken into consideration with drinking-water dispenser, build-in washroom, air-condition and sufficiently spacious seating arrangements. May I request for the past worksheets prior to my child joining the Centre? Your child will only be provided the material from the point of joining the Centre. The past worksheets will not be provided. May I request to stop attending the tuition lessons during the school holidays? The lessons of onSponge extend over 48 to 52 weeks. The lessons during the school holidays are NOT holiday lessons and are part of the curriculum. It is therefore essential that all students avail for as many of these lessons for completion of the curriculum for the year. • The child would miss part of the curriculum and no make-up lessons will be arranged. • With recruitment taking place throughout the year and given the limited places, all centres are required to optimise the class attendance. For students who wish to stop lessons during the school holidays, the places will be released for open booking by the public. • For cases where existing students’ seats are released yet keen to continue after the holidays, these cases will now be considered as new registration. As we do not take reservations for new students, new registration means the child’s placement (now considered as new student) will subject to the vacancy level at point of time of registration. The $100 deposit will be refunded as in the case of withdrawal, given 1 month notice and the $40 admin fees and $50 material fees will apply once more upon new registration. What is the duration of a lesson? Lesson time for P3 and P4 is 1.5 hour and P5 and P6 is 2 hours. Will the Tutor keep a close watch over my child’s behaviour in class? The Tutor will maintain classroom discipline with students expected to co-operate and comply with the general orderliness during lessons. However, students must bear personal responsibility for their own behaviour in class including care over their personal belongings and safety. Students are not encouraged to bring along expensive personal items to class or engage in activities that may lead to potential accidents. The Tutor and the learning centre do not accept liability or responsibility for any harm to a student resulting from accident nor the loss or damage of personal property of any kind while in the tuition premise. Will there be any replacement lesson should the student be absent? You are provided a schedule of the lessons upon commencement of your child’s lesson. Your child is strongly advised to attend all lessons so to ensure minimal disruption in learning as there will be no replacement for lessons missed. Subject to availability of space and similar pacing of lesson, you may be invited to join another class. This invitation is extended as a goodwill gesture and strictly non obligatory on the part of the centre. Will there be lesson when the day of the lesson falls on a public holiday? provided by the tutor including school holidays unless rescheduled by the tutor. How will the students’ progress and performance be assessed? Mock-tests or Review Worksheets will be given to the student at least twice every term to gauge the student’s progress and also to prepare the student for the school’s examination. Is my child’s performance guaranteed? We do not guarantee performance but offer the core requirements to assist a child to release his potential. The Tutor has a track record for helping children to attain their desired score along with the merits of the thinkingMath programme where materials provided are specially developed to facilitate learning in preparation for the PSLE. Generally, about 90% of our students will improve by at least 1 grade depending on their entry score as our student based is made up of a wide-span of abilities from borderline to A. The performance of a child is also dependent on many factors including the child’s personal motivation, discipline in completion of work provided, attentiveness in class and learning attitude. Your support and encouragement at home will certainly help in the enhancing of the child’s learning and performance. May I transfer my child to another Centre? Yes and the 1-month written notice for withdrawal will still apply. In addition, you will also be required to pay the next centre the $40 registration fees and $50 material fees. What is the procedure for withdrawal? (b) fulfilment of one month's notice prior to withdrawal. The date of notification for withdrawal will take effect from the date of submission of the Withdrawal Form. All lessons are to be paid and attended during the month of notice served. You can send your enquiry through our online form, or get in touch with your preferred Oodles Learning Centre.